Following a four-week inside and outside total renovation, McDonald’s of Pomeroy held its Grand Re-Opening on Monday morning. The four week project was a little over a $1 million investment in the restaurant, bringing in the latest in technology with ordering kiosks, LED menu boards and other upgrades. In addition, servers will now bring orders to the customers at their seats following their orders placed at the new kiosks. The restaurant is having special deals throughout the week to mark the event. Taking part in the ribbon cutting event on Monday morning were owners Greg and Teresa Mills, the Meigs County Commissioner’s Office, American Legion Post 39 and others. Greg Mills presented a donation to the American Legion for their part in the event, as well as the Racine Volunteer Fire Department for their assistance in cleaning up after the construction. 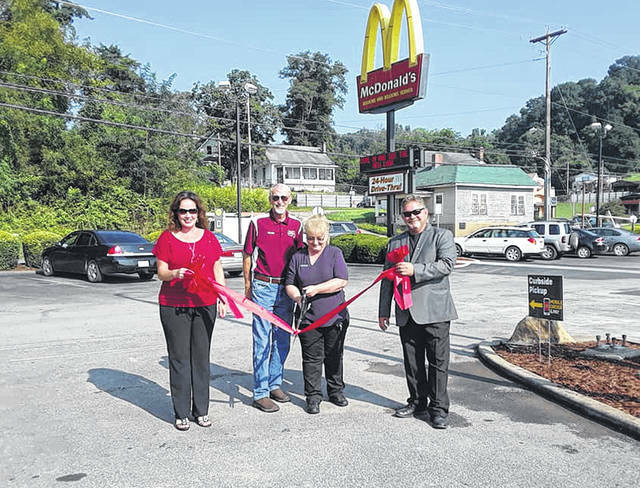 https://www.mydailysentinel.com/wp-content/uploads/sites/14/2018/08/web1_8.30-McDonalds.jpgFollowing a four-week inside and outside total renovation, McDonald’s of Pomeroy held its Grand Re-Opening on Monday morning. The four week project was a little over a $1 million investment in the restaurant, bringing in the latest in technology with ordering kiosks, LED menu boards and other upgrades. In addition, servers will now bring orders to the customers at their seats following their orders placed at the new kiosks. The restaurant is having special deals throughout the week to mark the event. Taking part in the ribbon cutting event on Monday morning were owners Greg and Teresa Mills, the Meigs County Commissioner’s Office, American Legion Post 39 and others. Greg Mills presented a donation to the American Legion for their part in the event, as well as the Racine Volunteer Fire Department for their assistance in cleaning up after the construction.